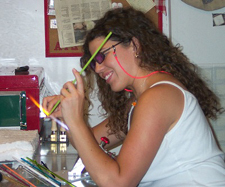 We are a group of glass artists who are dedicated to the art of lampworking, an ancient art form that flourished in Italy in the 1300s and then spread throughout Europe, the Americas and the rest of the world. 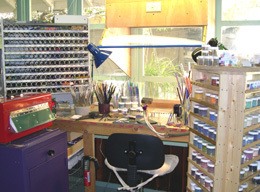 We work at home in our own studios, making beads, marbles or other glass objects one at a time. Patiently and carefully we strive for perfection in every object that we make. We are from the USA, Canada, Australia, New Zealand, the UK, Israel, Germany... all over the world! As self-representing artists, one of our greatest challenges is finding ways to bring our art before the people who want to own it, and educating those buyers about the uniqueness and quality of our work. We hope that this directory will help you to discover us and learn a little a bit more about our process, our studios, and our personalities; and, of course, our art! "I took my first lampworking class in November, 2002, at a local glass studio in St. Louis. A year and a half later I decided to start working on my own studio in my garage since I love lampworking so much! It took a while to get all of the items for my in-home studio, but now that it's done... it was totally worth it!"